Aimed for July 5th, 6th, and 7th, 2013. 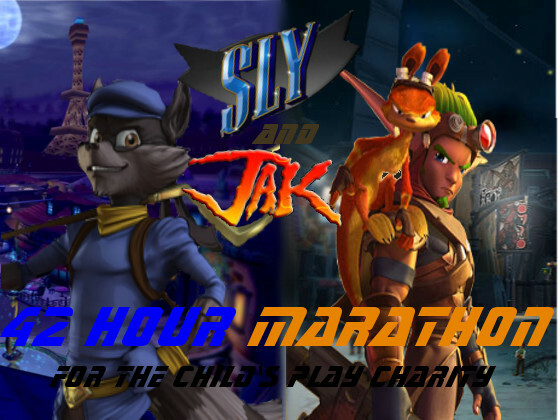 The Sly And Jak 42 hour marathon will consist of all four games from the Sly Cooper series and four games from the Jak and Daxter series including the first three main games and Daxter. The games will be played in this order; Sly Cooper and the Thievius Racoonus, Jak and Daxter, Sly 2: Band of Thieves, Jak II, Sly 3: Honor Among Thieves, Jak 3, Sly Cooper: Thieves in Time, and Daxter. These games will be broadcasted live through Twitch.tv and donations made throughout the marathon will go to the Child's Play charity. An interview with Kevin Miller, the voice actor of Sly Cooper, is currently in works. We are waiting for a reply from him and if he agrees with the interview, viewers will be able to talk with him and ask him questions about his career. Prizes will possibly be given away during the marathon, but this has yet to be confirmed. As always, we will be doing viewer requested challenges as we get closer to our donation goal (which will be around $500, depending on how many followers we can gain). Past challenges include 2 liter soda chugging, embarrassing dances, singing, and other crazy stuff. In short, we'll do almost anything! We're currently taking requests in our forums so if you want to leave a challenge idea, go check it out! For those of you who don't know what the 'Adopt a Rocket' program is, 'Adopt a rocket' is a program we have every year at our school where we (this is the literal slogan) "Make Christmas happen for a kid in need." What this means is with every $100 we can raise in our class (the class we're in is animation, by the way), we 'adopt' a child in need and use that money to buy gifts and other things that child needs such as sleeping bags, clothing, toys, and many other things! (we would show the actual picture for the adopt a rocket program as our marathon pic...but the picture is so terribly made.....its not worth showing....so we made the picture above instead.) Our goal for this marathon is to raise enough money to adopt between 3 to 5 children. So please help support our cause by watching and donating in our marathon. We appreciate the support. Our Upcoming Marathon. We'll be playing all of the Crash Bandicoot PSone games non-stop, all 100%. Of coarse, we're doing this to raise donations for the good of others. This year, donations are going to Children's Miracle Network. We're giving you more than just gaming. There's also going to be live commentary and live chat for viewers. Not only that, but with every game we play, viewers will have a chance at winning a Crash Bandicoot T-shirt. All you have to do is donate five dollars and you are entered into a raffle for a t-shirt. (NOTE: you can only enter each raffle once, but you can enter into multiple raffles.) There will also be times in the marathon where we ask a certain trivia question with four answer choices. The first one to answer the question correctly will win a $10 gift card to gamestop. You will have three chances to win a giftcard: one will be halfway through Crash 1, another halfway through Crash 3, and the last one halfway through CTR. There will also be a grand prize that goes to whoever donates the most money throughout the entire marathon. That person will win a japanese copy of Crash Bandicoot 3: Warped. We're not stopping there. There's a lot more we're doing to keep you guys entertained. Our team decided that the closer we get to our donation goal, the more we should do. So to do so, we're going to do some crazy challenge with each 100 dollars donated. The closer we get to our goal, the crazier the challenge will be. THIS MARATHON HAS ENDED! We only raised $25 of the $1000 we were hoping to raise. We believe our failure was because of the un-popular franchise we used. So in future marathons we will be sure to use franchises that are well known and very popular. Thank you to those who watched and donated. We appreciate the support we had.